I love granola. Maybe it’s the crunchiness. Maybe it’s the fact that you eat a super tiny bowl and are stuffed, so you feel virtuous. However, I have made lots of granola and the incredible amount of oil that is used in the recipe offsets the virtuosity of eating a tiny bowl. So began my quest for an even healthier option for granola. I found this recipe in a library book years ago and fell in love with it! 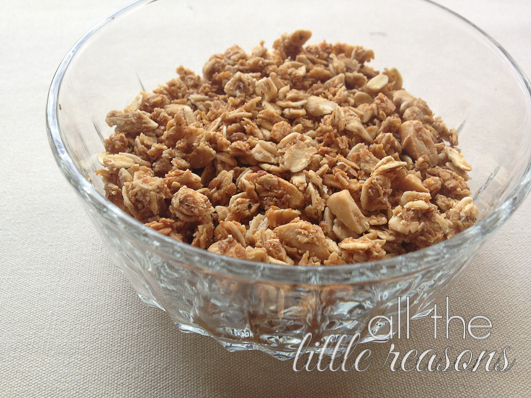 I think the thing that intrigued me the most was the use of coconut milk to coat the granola. I thought that was brilliant! While it still has quite a bit of sugar, the oil content is drastically reduced. So enjoy! Mix the dry ingredients together in a large bowl. Combine the wet ingredients together and drizzle over the dry items, tossing to coat completely. Spread out mixture on a half sheet pan in one even layer. Bake in a 300 degree oven for 1 hour, stirring every 15 minutes for the first 45 and more often the last 15 minutes. It should be browned and toasty! I always double this recipe. 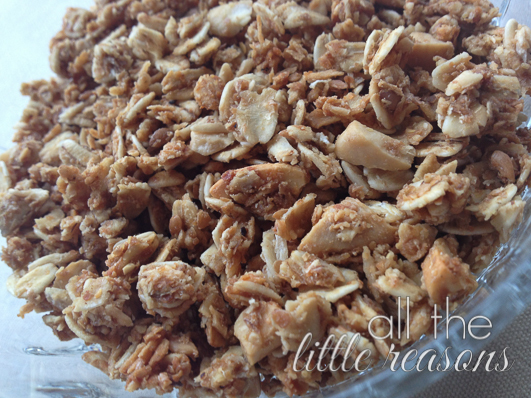 First, because I’m lazy and don’t want to make granola all the time. Second, because 1 can of coconut milk is a double batch, so it’s perfect!